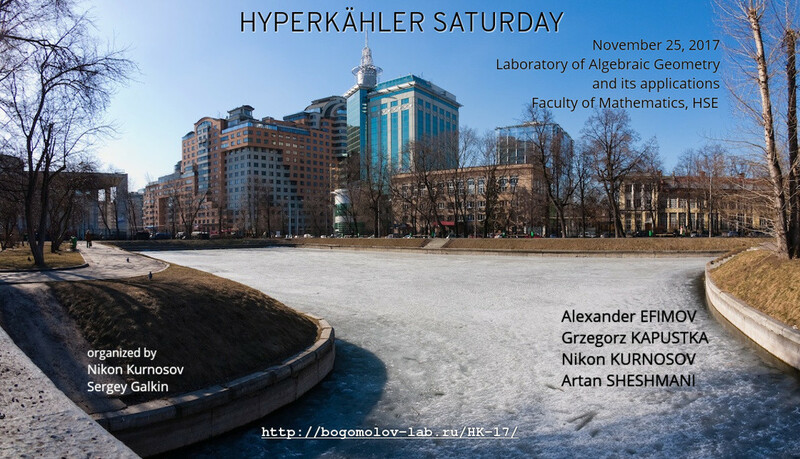 10:30-11:30 Grzegorz Kapustka: Non-symplectic involutions on IHS fourfolds. I will talk about our recent work with A.Soldatenkov and M.Verbitsky. We show that all cohomology of hyperkahler manifold X can be embedded into the cohomology of the product of several copies of abelian variety A. This is the generalization of classical Kuga-Satake construction, which attaches to the rational polarized weight 2 Hodge structure of K3 type H an abelian variety A and an embedding of H into the second cohomology of A, compatible with Hodge structures. Recall that two complex algebraic varieties are called L-equivalent if they have the same classes in the localization of the Grothendieck ring of varieties with respect to L (the class of affine line). In this talk I will disprove (the original versions of) two conjectures on L-equivalence, due to Huybrechts and to Kuznetsov-Schinder. The first one states that isogenous K3 srufaces are L-equivalent, and the second one states that derived equivalence of smooth projective varieties implies L-equivalence (the second conjecture fails already for abelian varieties). Moreover, it will be shown that both for K3 surfaces and for abelian varieties each L-equivalence class contains only finitely many isomorphism classes. Our results on non-L-equivalence are deduced (via integral Hodge realization) from the very general (and quite surprisingly, new) results on the Grothendieck group of an additive category whose morphisms are finitely generated abelian groups. The talk is based on the preprint arXiv:1707.08997. Non-symplectic involutions on IHS fourfolds. We present recent progress on the classification of IHS fourfolds of K3^ type admitting a non-symplectic involution. In particular, we discuss geometric constructions of maximal dimensional families of IHS fourfolds of K3 type with involutions having invariant lattices: U(2)+D_4(-1) and U(2) + E8(-2). These are the only possible invariant lattices that are not obtained via previous constructions of Mongardi and Wandel. This is joint work with C. Camere, M. Kapustka and G. Mongardi. We study Pandharipande-Thomas (PT) stable pair theory on smooth K3 fibrations over curves with possibly nodal fibers. We describe stable pair invariants of the fiberwise irreducible curve classes in terms of Kawai-Yoshioka's formula for the Euler characteristics of moduli spaces of stable pairs on K3 surfaces and Noether-Lefschetz numbers of the fibration. We further investigate the relation of these invariants with the perverse (non-commutative) stable pair invariants of the K3-fibration. In the case that the fibration is a projective Calabi-Yau threefold, by means of wall-crossing techniques, we write the stable pair invariants in terms of the generalized Donaldson-Thomas (DT) invariants of 2-dimensional Gieseker semistable sheaves supported on the fibers. This talk is based on arXiv1308.4722.